NB: CHIC is itself history, as for several reasons it was forced to close in 2012 (see bottom of page) after only two years' existance. The following text was written when CHIC first opened, with a couple of later update sections. 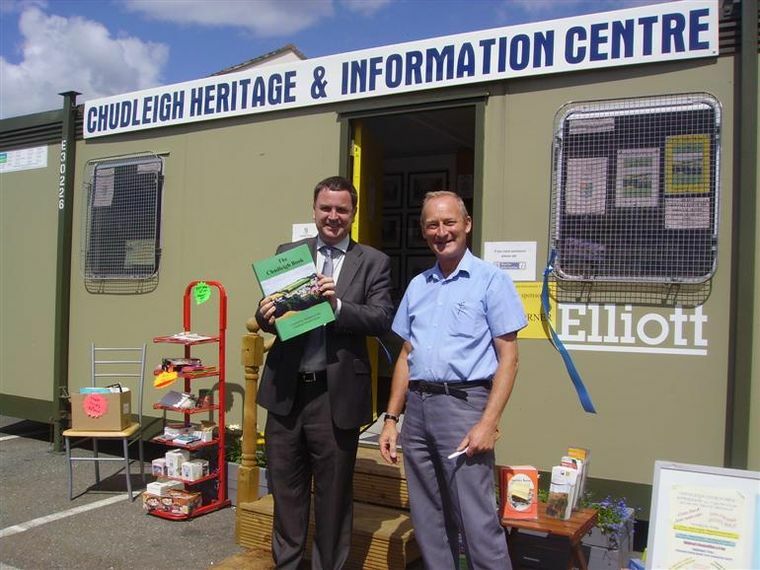 On Friday 28 May 2010 the Chudleigh Heritage and Information Centre (CHIC) opened its doors to the public for the first time. Staffed by volunteers, the facility opened daily throughout the summer months and into the early autumn as follows; Monday to Saturday 10:00 - 16:00 and Sunday 10:30 - 12:30. With the onset of autumn the opening times will be reduced so if you are planning a visit please get in touch via the 'Contact' page. The two facilities are housed together within a unit that is sited prominently in the town car park. Inside the space has been split into two distinct halves, one the Heritage Room, the other a Tourist and Local Information Centre. 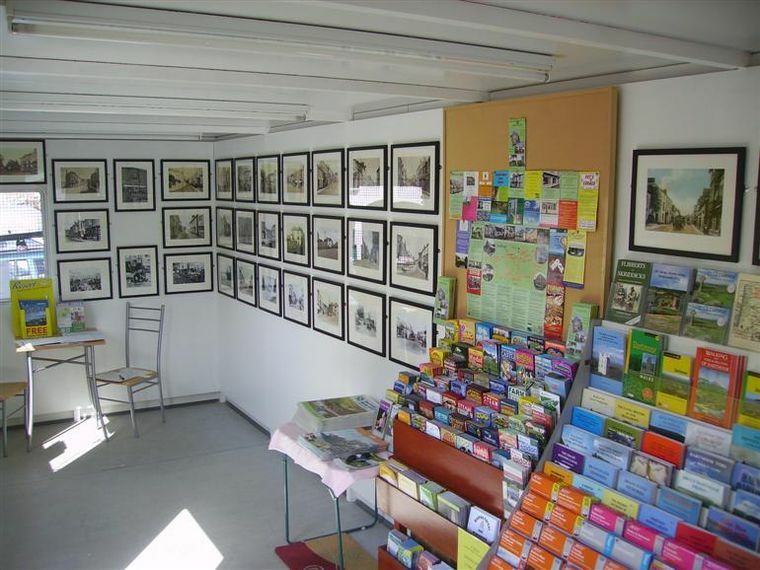 Initially the heritage area comprises a display of forty-two framed photographs depicting the town in through the 100 year period 1855 to 1955. In time it is also planned to make available to visitors the wealth of printed historical information that has been put together over the years concerning the history of our town and parish. Help will also be on hand to point people in the right direction if they should wish to research their family roots or perhaps the history of their house. There are a number of free leaflets covering the services of both the Devon Record Office and the Westcountry Studies Library to help you in your searches. It is also intended that an album of old photographs will also be available to browse and any of these will be available to purchase as a framed enlargement. The enlargements (12"x 8") are £8.00 each and mounted and framed £25.00. The Tourist and Local Information Centre is set up as you would expect, with the usual free tourist leaflets and guide books. In conjunction with Orchard Publications many Devon books and Ordnance Survey maps are available to purchase, including The Chudleigh Book and other specific titles concerning the town and local area. Dartmoor and Chudleigh postcards are currently available and in time locally-themed souvenirs will also be available to purchase. Information Boards are promoting local 'Forthcoming Events' and displaying local business advertisements. If you are a local club, society or business and have something to advertise please come along with your posters/literature, we will be pleased to display it for you. The ultimate aim is to provide a facility of which the town will be proud. It is proposed that the centre will provide a one-stop location for those visiting our area or residents who would just like to find out a little bit more about their immediate surroundings either in a current or historical context. The continued success of the centre will depend entirely on its visitors and we have welcomed many of you already in our first months of opening. In addition to many local visitors this past summer we have seen those from all over the UK and from a variety of countries abroad, our visitor book has fast become a gazeteer of places near and far! On a number of occasions our visitors have helped to fill gaps in our knowledge of the town and in some cases provided us with copies of photographs we had not seen before. The facility is self-funding and the History Group will be organising various ongoing fund raising activities and looking to local businesses for sponsorship. There is also a 'Donation' box located at the centre and if you feel so inclined you may like to assist our cause by making a donation at the time of your visit. The centre is staffed by a growing number of willing and enthusiastic volunteers. If you can spare some time to help with this exciting project as a volunteer please go to the 'Contact' page and send us an email or alternatively telephone the CHG Chairman, Mr Alan Brunton for further information. Mel Stride MP with CHG Chairman Alan Brunton at the formal opening of the centre on Saturday 17 July 2010. 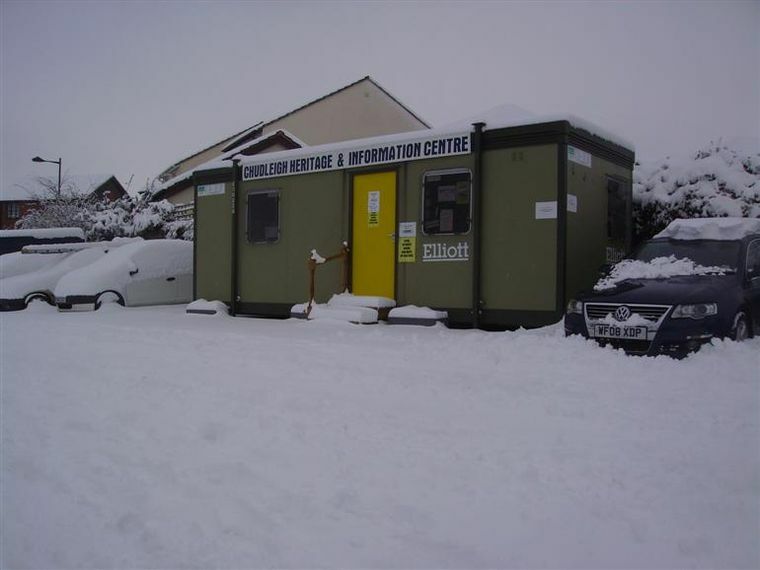 With changes to the Devon Library Service in 2011/12 we gave up the portacabin and relocated the Heritage Room facility into the Chudleigh Library that is located within the old school building nearby. The move to our new accommodation took place on 6 June 2012. Opening times changed and on days when the library facility is closed and the Heritage Room/Information Centre open, two volunteers would be on duty covering the Heritage Centre. History Group Chairman Alan Brunton welcomed the move and said at the time it was a 'win, win, situation'. County Cllr. Gerry Brook commended the centre and the 'enormous benefit it has for the community'. Unfortunately local facilities generally in 2012 saw a downturn in visitor numbers and due to the remote Library location at the bottom end of the car park, 'footfall' dropped sharply in 2012. Futher, the changed opening hours and increased Library-related responsibilites (when the Library facility itself was closed) meant fewer volunteers to staff the centre, so the decision was taken to close CHIC at the end of 2012.